Who would not want silk tablecloths draping their event tables? 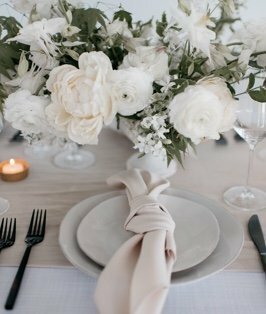 Our Shantung rental table linens are the way we can all afford this lusciousness. Suggestive of vintage polished English silver, Silver Shantung is the perfect neutral that is like the ultimate piece of jewelry where you will want to make all jealous. Your event will be dressed even better than your guests in these fashion inspired hue and texture.